Are you looking for someone to facilitate a workshop, give a lecture or presentation, dance at an event? The Sacred Dance Guild provides a global membership community of professional dancers, from diverse backgrounds and experience who can meet your needs. This fellowship of spiritually diverse sacred dance presenters are passionate movement artists who embody the universal language of the soul, while furthering one’s connection to body, mind, spirit and heart. These facilitators provide an inclusive and rich sacred dance tapestry for promoting peace, harmony and justice through movement. This artistic kaleidoscope nurtures the synergy of dynamic exchange furthering the Sacred Dance Guild’s motto of “Dancing the Sacred, Moving the World”. It would be our pleasure to have one of our Sacred Dance Guild presenters work with you in whatever way we can. Simply soaring during class at Festival 2010. The Sacred Dance Guild Board of Directors has approved the following members to be listed as Sacred Dance Guild Facilitators. Click on the member name to find out more information about their background and what they can offer related to dance as an expression of the sacred. If you would like additional information, have questions about this program or would like to connect with any of these facilitators, please contact prog@sacreddanceguild.org. Are you a Sacred Dance Guild member interested in becoming an SDG approved facilitator? If so – contact prog@sacreddanceguild.org and we will send you the requirements and the application form. All applications are reviewed for approval by the SDG Board of Directors. Note: In addition to the SDG approved facilitators listed below, there are members who are willing to volunteer their time to assist with various sacred dance activities (i.e. starting s dance choir, providing sacred dance awareness sessions/activities, dance at a community or worship event, etc.). This information is available on the SDG Members Only section of the website. These are just some of the workshop possibilities that these facilitators can present. If you would like to develop a workshop around another topic, discuss it with your facilitator or contact the SDG for suggestions. Helena Froehlich is a dancer, teacher, choreographer, and energy practitioner. She has lived and danced in France, Germany and the USA. Along the way she has studied dance and movement forms, mostly ballet and modern dance, and received several scholarships and grants for her dance and choreographic endeavors. Since 1978, she has been dancing, teaching or choreographing in many companies and schools including: École municipal de danse Strasbourg, Opera du Rhin, Centre National de Danse Contemporaine, Association & Compagnie CreationDance (France), Stadt Theater Biberach, Tanz! (Germany),and the American Repertory Ballet, Princeton. She is currently teaching at the Boston Ballet School. Helena is the artistic director of CreationDance, in residence at the First Unitarian Society Newton, dancing in churches and performances around the Boston area. She loves dance, spirituality and exploring human nature. She creates dance pieces that help people to enjoy and share more of who they are. She believes that sacred dance is a wonderful way to develop, experience and share wholeness, inviting the spirit, mind and emotions to connect, heal and move our bodies. She believes that human beings are like musical instruments, and that they tune and raise their energy as they dance, resonating with everyone around them and with the planet. Helena encourages her dancers to experience dance as a moving prayer and meditation, as a daily practice indoors or in nature. In performance, she creates and shares dance in many ways so that everyone can participate. She studies several energy modalities and is a certified practitioner of the EMF Balancing Technique. of California, Berkeley. Cherie has recently had the pleasure to perform in the works of Adjei Abankwah, David Dorfman, Kathleen Hermesdorf, Onye Ozuzu, and Helander Dance Theater. Mary Francis Hoffman has taught at two Sacred Dance Guild festivals and facilitated multiple workshops for the SDG’s local network in Hawaii. She is an Expressive Arts consultant and educator and has her Doctorate in transpersonal psychology. 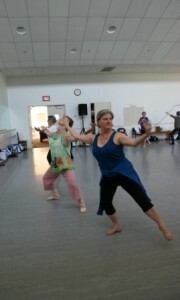 She uses authentic movement for the facilitation of embodied self understanding. She see nature as a key witness when using this form outdoors. She uses authentic movement as her own spiritual moving meditation practice. Sandra Kammann is an educator, choreographer, theatre director, and anthropologist interested in the powers of human expression and visionary performance. Creating multi-art performance projects since 1978, she is founding director of We the Temple, a non-profit organization dedicated to offering transformative events and high caliber education for adults, youth, and children. Sandra holds an MA in Cultural Anthropology: Performance & Transformational Theatre from the George Washington University, graduating with honors. She danced professionally in New York Cityt, and trained at Studio Theatre Acting Conservatory, completing the three year Professional Training Program under renowned Founding Artistic Director Joy Zinoman. Sandra is Sacred Dance Program Director for the Unitarian Universalist Church of Arlington, Virginia, where she has been awarded three grants through the Pamela Endacott Fund, and an Outreach Grant from the National UUA. A dedicated dance educator known for spotting talent, motivating students and helping them unlock their emotions through dance. While attending the University of Cincinnati’s College Conservatory of Music, she studied under Oleg Sabline, and James Truitte. Always seeking to learn more about dance, Mary has taught and performed across the USA and abroad, currently she is a Lead Teacher at de la Arts Place, a non-profit performing arts center. Ms. Kamp leads Liturgical Dance workshops, directs the Liturgical Dance Ministry at Kennedy Heights Presbyterian Church is a member of the Worship Ministry and the Presbyterian Association of Musicians. She also serves as Co-Director of Programs on the Board of Directors of the SDG. In the summer of 2012, she was Co-Director of the “Dance A World of Hope” Sacred Dance Festival, held at Hope College in Holland, Michigan. An advocate for all performing arts, Ms. Kamp is an adjudicator for the Overture Awards, has served on the Arts Allocation and Public Art Commissions for the City of Cincinnati and the Kennedy Heights Arts Center Artist-in-Residence selection committee. Rev. Dr. JoyBeth Lufty is an author, dancer, teacher, and interfaith minister. She is the author of four books and has taught internationally on holistic spirituality. She served on SDG’s Board of Directors for many years. JoyBeth specializes in teaching body prayers from many traditions, including how to create your own. She also teaches “Soul Dancing,” or dancing from the soul as a spiritual practice. As Founder and Artistic Director of Alleluia Dance Theater, it has been Stella’s privilege to bring dance as a form of worship to others. She has choreographed, taught and performed throughout the United States and Canada. After studying at West Coast School of Dance and Music and UCLA, Stella joined the Gloria Newman Dance Theatre and became a principal dancer in her company. She developed and taught the dance major at Moorpark College, where she was responsible for the entire program, teaching a full load of various dance styles: modern dance and choreography, ballet, jazz dance and tap dance. Although retired, Stella is still involved with the college, providing a scholarship each year to the outstanding dance student of the year. Since 1978, she has presented sacred dance and women’s retreats at La Casa de Maria, a retreat Center in Santa Barbara, California. In 1995, she was the keynote speaker and one of the main presenters for United Methodist Church Music and Worship in Tacoma, Washington. She was also the keynote speaker for the American Guild of Organists in Memphis, Tennessee in 2002. In addition to dance, she also teaches Tai-Chi. She is a past president of the Sacred Dance Guild and she was the chair of the SDG’s international Sacred Dance Festival in 2003. She has facilitated many workshops for the SDG over the years, both at festivals and at regional workshops. Melissa Michaels, EdD, is the founder and director of Surfing the Creative International Rites of Passage Programs, Golden Bride and Wild Life Productions. She is a social artist and dancer dedicated to our collective renewal through the liberation of the creative spirit. She creates dance-based educational opportunities, focusing on consciousness and embodiment for people in all of life’s cycles. Mapping the journey from trauma to dynamic well being, her work utilizes the expressive arts to establish body and heart as resources for living. Her movement-based programs serve individuals and communities around the world navigating their way through major life thresholds. Kathryn Mihelick is the founder and director of Leaven Dance Company. She was Assistant Professor and Director of the Dance Division at Kent State University, where she received her MA in Theatre and Dance. She was an adjunct faculty member at John Carroll University and served as a curriculum writing panelist for the Ohio Deartment of Education. She performed professionally with Orchesis Ensemble, the Heidt Touring Company, as solo dancer with Indianapolis Starlight Musicals, and was resident choreographer for Porthouse Theatre at the Cleveland Orchestra’s Blossom Music Center. Among her choreograqphy credits are the dance sections presented with composer Alexander Peloquin’s performace of his “Lyric Liturgy” with the Canton Civic Opera for the anniversary celebration of Walsh University; John Rutter’s “Requiem/Pie Jesu” for the Presbyterian Church in New York; and “Touch of the Spirit,” commissioned by the Akron Area Association of Churches for the Northern Ohio Ecumenical Pentecost Celebration. A scholar of sacred and liturgical dance, she has lectured, performed and presented sacred dance workshops and retreats throughout the U.S., Europe, Asia, Australia, and Hong Kong, where she was one of five dancers chosen to introduce sacred dance at the 1991 International Dance Research Conference. She developed a video series on “Sacred and Ritual Dance History” for the Seminary of the Air telecasts sponsored by the Akron Area Association of Churches. Most recently Kathryn has spearheaded an advocacy effort to get the U.S. Conference of Catholic Bishops to officially affirm dance as a valid form for worship. In 2003, OhioDance named her the recipient of their award for “Outstanding Contribution to the Advancement of the Dance Art Form,” and in 2005 she received the Akron Area Arts Alliance’s “Outstanding Artist in Dance” award. She has served on the boards of OhioDance, the SDG, and is a member of the Advisory Board of Kent State University’s School of Theater and Dance. In 2008, she was awarded the SDG’s “Living Legacy” citation. Leaven Dance company’s work has been recognized and supported by grants from the Ohio Arts Council, Asian Arts Council, as well as several regional Foundations. Her workshops are designed to use movement and the dance art form to address and explore various elements of spirituality, and may be adapted to all age groups, elementary school children through adults. You may select from more than 20 different workshop themes, such as Gift of the Body; Soul to Sole, Exploring God’s Creation, Making Dance Divine, Movement As a Language of Prayer, Moving the Scriptures, Building Community, Pathways to Peace, and Movement Meditation. Avital Miller has been involved with movement since the age of four. She grew up practicing gymnastics and dance, received a Dance Major at Washington University in St. Louis, Missouri, and has performed various styles of dance professionally around the world. As an adult, she discovered yoga and has been involved with Ananda Yoga since 2004. Since then she has been combining what she learned about dance/movement therapy with the spiritual path. She believes movement can be a tool for transforming our inner selves and sharing God’s joy. She has been leading healing and spiritual dance workshops and retreats around the world including at The Expanding Light in Northern California and the Sacred Dance Guild Festival 2015. She also has a Major in Mechanical Engineering. She has also spent her time at Ananda being a Teacher Trainer for the Yoga Teacher Training Program at The Expanding Light, and Sales and Marketing Director at Crystal Clarity Publishers, Ananda’s North America publishing company. She looks forward to continuing to share dance in a way most meaningful to her. Avital has developed and facilitates four sacred dance workshops/performances: 1) “The Dancer as a Channel: Using Dance and Movement as a Therapeutic and Healing Tool” – Authentic movement can reveal a lot about our present state of mind and emotions. We can tune in more purely to the soul’s true song. Through consciously transforming the way we move we can shift our energy, heal, and come to peace and stillness within. With caring support, Avital will guide you into free authentic movement. She will define different forms of movement that relate to various behavior patterns. You will be lead through a journey to help discover and transform those movement and behavior patterns within yourself. Walk out the door having more freedom within and potential to expand into all possibilities. 2) “The Dancer as a Channel: Dancing into Divinity” Our soul’s true song gets revealed the more we can tune into the Divine within ourselves and the universe. This workshop will include an exploration of eight main aspects of the Divine through the movements of our bodies, feelings in our heart, and thoughts in our mind. There is no greater joy and blessing than tuning into our true essence and sharing that with others. 3) “The Dancer as a Channel: Art as a Hidden Message” – Art can be utilized to share the powers of the Divine inspiring people to aspire to their highest potential. Learn about choreography aspects that help portray the spirit of God and even learn some of Avital’s spiritual dance choreography. 4) “The Dancer as a Channel: The Dance into Divinity Performance” – Avital has combined her love for all forms of dance with the peace and love she feels from meditation to share the Divine through movement. Through her dance reminiscent of higher realms, she brings a joy to her audience that touches the heart. The grace of human form and movement shine through her smile as well as her steps. Emmalyn Moreno is a pianist, percussionist, singer and dancer who uses her God-given talents to minister through music and dance. She is deeply involved with several interfaith groups and serves as a liturgical musician for the Military Chaplain Corps and the Military Catholic Archdiocese at Camp Pendleton, California. Emmalyn is a member of Alleluia Dance Theater and director of Movin’ With the Spirit Ensemble. Her original composition and choreography “We are One” (Moving Mysteries) is the Sacred Dance Guild’s official dance and song. She is an ethnomusicologist with experience in several dance styles including modern, lyrical, and liturgical as well as various ethnic dances. She is open to developing workshop topics, taking into consideration the needs of all your community, using her experience with children’s programs, adult choreography and musicality. Laura Padgett holds has an MA from Regis University, where she studied storytelling through creative movement with an emphasis on sacred dance. She has led workshops at retreats, churches and church camps on dance as healing, prayer and praise, and as a way of creating an inclusive community. She teaches children creative movement at South Table Mountain Preschool in Golden, Colorado. Her dance background is in competitive Irish dance, African dance and messianic dance. She ministers at various churches in the Denver/Golden area using storytelling and dance. Her MA work culminated in a book, Moving into the Holy, a scholarly work that explores dance as a form of prayer and spiritual exploration in conjunction with lectio divina style meditation. David Taylor has been professionally involved in the Colorado dance community for the past forty- one years. He began choreographing in 1976 during the course of a twelve-year dance career, and since then has created over one hundred original works. In 1979, he founded the David Taylor Dance Theatre (DTDT), one of the Rocky Mountain Region’s most acclaimed, well known and respected dance organizations, and Denver’s original contemporary ballet company with a reputation of presenting outstanding innovative works. As the principal choreographer for 27 years, Mr. Taylor’s unique creative focal point became a fascination with the ritual of ancient cultures, metaphysical concepts, and multi-media collaborations which served to provide DTDT with a stunning and thought-provoking identity within the world of professional dance. He received the City and County of Denver’s first Individual Artist Fellowship Award for Dance for his critically acclaimed collaborative work, “Anasazi Dream” in 1987, the Governor’s Award for Excellence in the Arts in 1997, and the Carson-Brierly Dance Library’s “Living Legends of Dance” award in 2006. A recipient of three National Endowment for the Arts grants, his critically acclaimed productions of “The Nutcracker” and “Rainforest” have been presented throughout the United States and he has also been commissioned to stage ballets for the Dayton Ballet in Ohio, the Lone Star Ballet in Amarillo, Texas, the Canyon Concert Ballet in Fort Collins, Colorado and the Aspen Santa Fe Ballet. Mr. Taylor currently serves as a faculty member at Colorado State University in Fort Collins, teaching dance history, and as a guest faculty member teaching intermediate and advanced ballet technique, pointe, pas de deux, men’s class and variations for various ballet schools and companies along the Front Range and continues to be in demand as a summer intensive guest teacher for ballet programs throughout Colorado. He also conducts workshops on sacred dance for various statewide organizations, and has appeared twice as a major presenter at the SDG’s Sacred Dance Festival. Besides still serving as the Artistic Director Emeritus for the David Taylor Dance Theatre, Mr. Taylor founded a new company, the Zikr Dance Ensemble, in the summer of 2009. The Zikr Dance Ensemble offers a spectrum of works that are based on transcendent dance rituals from many different ancient world cultures along with original and contemporary dance/theatre realizations. The company’s roster includes some of the finest ballet-trained dancers from various companies along the Front Range and Zikr has already presented successful performances in Denver, Fort Collins, Boulder, Aspen, Carbondale, Grand Junction, St. Paul, Minnesota and Long Beach, California to critical acclaim. Diana Turner-Forte is a teacher, dancer, artis and writer as well as the director of Choreographic Institute of North Carolina based in Southern Pines. Her professional dance career spans nearly four decades performing throughout the United States and Canada, as well as in Mexico City. She brings a maturity and wisdom to her presentations of dance in sacred celebrations, concerts, worship services and workshops. The recipient of numerous awards and grants for excellence in dance Diana has been recognized by both regional and national organizations. Her workshops and classes focus on holistic experiences that engage body, mind, and spirit and crosses generations because the teaching and activities speak to the most fundamental aspects of the human spirit. She has been a featured artist for Muse & Spirit, a publication of the Center for Faith and Arts in Salisbury. Her work has been showcased at local and regional churches and most recently at North Carolina Diocesan Conventions during worship and in workshop settings. As an artist-educator, Diana holds an MA in Dance, with complementary skills in somatic studies, brain-body integration, and therapeutic well-being. Additionally, Diana is committed to preserving the integrity of sacred dance and deepening community’s understanding of the role of the art of dance in healing, prayer, and worship. She is professed in the Third Order of the Society of St. Francis. She has developed and facilitates three sacred dance workshops: 1) “Sacred Dance Studies” is a workshop designed to provide a framework for the ministry of sacred dance, whether forming a group or expanding skills. The workshop is experiential and practical, aimed at the specific needs of the congregation and community. The intent is to engage in concrete tasks to open creative channels for worship, prayer and special services through movement, and to enable participants to define for themselves the direction they wish to go through the use of dance. Participants will receive a current copy of Diana’s Expressions of the Body. 2) “Peace” is a workshop based on four virtues of Franciscan spirituality. The qualities of openness, humility, joy and love will be explored through movement, providing participants with simple experiential practices to embody these virtues. Full of the energy and wisdom that inspired Francis of Assissi, this is a beneficial workshop for people of all ages. 3) “Experiential Healing” is designed to engage, allow, and hold sacred space for releasing trauma and suffering through movement. The trauma can be communal, personal, national, local, recent, past or merely a lingering sadness that simply will not go away. Participants are asked to save the entire day for this workshop in order to receive the full benefit as the activities are cumulative and serve the purpose of inner renewal and wholeness. Kim Vetter is a dance artist, teacher, and student of life who creates work with the intention of facilitating transformation. She is the artistic director of Kosmic Dance Theatre and has been dancing and teaching for over 30 years. She holds an MA from SUNY Brockport where she focused her studies on dance in the African diaspora in Northeast Brazil and an MFA from UCLA in World Arts and Cultures. Her choreography has been presented in California, Maine, Maryland, New Jersey, New Mexico, New York, Oregon, and Pennsylvania. As a modern dancer, Kim has worked with many choreographers and directors including Garth Fagen, William Forsythe, Marco Antonio Silva of Utopia Dance Theatre, and Meredith Monk. Her interest in African dance led her to Salvador, Bahia where she studied Capoiera and learned to dance Samba. Kim founded the African dance program at the University of New Mexico and has led workshops for adults and children throughout New Mexico, the Northeast United States, the Baltimore/DC Metro area, and in Bahia, Brazil. Her study of Congolese dance and drumming under Titos Sompa, Mabiba Baegne and the late Malonga Casquelourd allowed her many opportunities to perform including a chance to work with world-renowned drummer Mamady Keita. Kim studied with and was apprentice to first generation Pilates teacher Kathy Grant. She has been teaching Pilates since 1995 and has taught in the Dance Departments at UCLA, University of New Mexico, SUNY Brockport, University of Oregon, Lane Community College, Coppin State University, and Colby College as well as private Pilates and yoga studios in New Mexico, New York, Los Angeles, and the Baltimore/DC Metro area. Having sustained a number of injuries, Kim uses her body as her ‘laboratory’ and is perpetually discovering new ways of moving to facilitate the healing and strengthening of the body. As a registered yoga teacher and avid student of tai chi and meditation, Kim integrates these practices with her continual exploration of movement potential to offer dynamic and healing classes. A lover of music and movement, Kim has participated in ecstatic dance, 5 Rhythms, trance dance, and improvisation for many years. As a facilitator of conscious dance, she hopes to make dance as accessible as possible for all who wish to move.